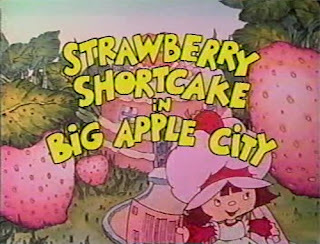 JA: So let's start with where you began your career in animation with Strawberry Shortcake in Big Apple City; when did you know that you wanted to pursue a career in animation, and how difficult was it to break into the industry in the early 80s? R.O. Blechman from The Ink Tank, R.Greenberg Assoc., and Tony Eastman. I couldn’t hook up with Blechman or Greenberg, but Tony and I hit it off immediately. He was an independent animator who was a hub of sorts because he worked in all realms of the industry. Commercials, shorts, theatrical – he did it all. He was nice enough to give me some stuff he’d already completed to in-between on. I did well enough to actually work on a real job, for money! This was in 1980, and after doing this three times I quit my restaurant waiter job. I was in heaven! Tony heard about the Perpetual Motion Pictures/Strawberry Shortcake job and referred me to Candy Kugel over there. I started in February of 1981. My first day on the job, as I was setting up my area, Jan Svochak (a future mentor of mine) wandered over and started talking to me, “You new here? Do you want some advice from an old-timer?” Needless to say, I thought I’d died and gone to heaven for the second time! I sheepishly replied, “Well, sure!” Jan started shouting, “There’s the elevator, run and get in it now! This industry’s dying and you still have time to get out!” Not exactly the answer I was looking for. JA: While learning the craft of animation that would prepare you for the work you do today, what were your feelings about the products you were turning out during that time? Also tell me about your father, Joe Sedelmaier, and the work he did in animation. J.J.: I learned the craft of animation on the job. I quickly hopped from being an in-betweener into being an assistant animator. The system back then at PMP was the assistants would pull a scene off the production manager’s (Nancy Lane) shelf and dig in. You never knew which animator’s work you’d get and you were never encouraged to even speak to them one on one. One thing I did notice is that Jan’s work was always so clean, well prepared, and beautifully drawn. 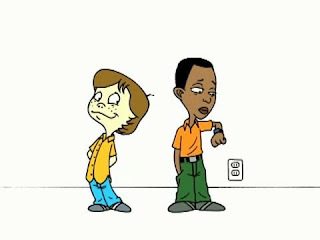 After working this way for a couple years (we had moved on to Berenstain Bears cartoons and the company was now called Buzzco) I approached director Al Kouzel and asked if I could assist Jan exclusively. He said he couldn’t allow that. I was enthusiastically persistent, and a few months later I was Jan’s assistant. This was a big deal. I was getting paid for a priceless opportunity to learn in a comprehensively consistent circumstance, visit to heaven number three. Now the other thing that prepared me for what I do today was my other employment in restaurants, especially while in school at UW/Madison. That experience taught me everything I needed to know to run a business. Busboy, waiter, host, bartender, manager – it all applied to what I do today. 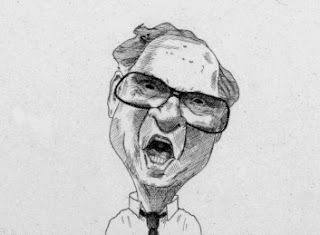 My dad, Joe, was a live action director and did the Wendy’s “Where’s the beef?” commercials among other classics. He changed the face of live action ads with his casting and use of humor. 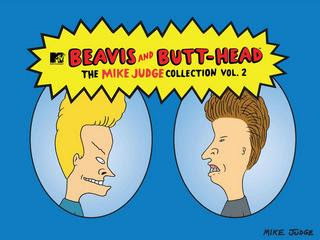 JA: In 1993 you launched the first season of MTV's Beavis and Butthead with creator Mike Judge, what memories do you have of working with Mike, and did either one of you realize just how big of a hit series you had on your hands? J.J.: Mike is one of the most creatively versatile guys I’ve ever met. Beavis was an experiment for Mike, MTV and JJSP. None of us had ever done a series before– 120 minutes in about six months. We started in November 1992 and finished end of May 1993. We had approved model sheets in April...that’s right, April. The entire experience was guerrilla production at its best. Mike was in on everything – art approval, casting, writing, voices, everything! It was also all done with digital ink & paint thanks to USAnimation in North Hollywood. No pencil tests – we went directly from board to layout to animation to ink & paint. I think MTV realized they had a hit half way through the first season. Patrice and I were very fortunate to have done something like Beavis so early on. It taught us exactly what we never wanted to do again. I don’t know if we would’ve been so perceptive if we had gradually worked our way into this. Fifty people worked on it. Too big. JA: Let's talk about how you became involved with Saturday Night Live; your collaboration with Robert Smigel brought about The Ambiguously Gay Duo, The X-Presidents, and the Fun With Real Audio cartoons, among others. What was it like being able to showcase your work on SNL, and what stands out most when thinking about your time at that studio? J.J.: Our relationship with SNL and Robert comes via my friendship with Jim Signorelli, who directs the commercial parodies. In 1992 Jim had a spot to do that was a live animation combo take-off on a fast food restaurant called “Cluckin’ Chicken”. It was Robert’s concept and, as SNL requires, he was acting as the producer of the piece as well. It was a great piece and has become a classic of sorts, but the process was arduous and I was convinced we’d never work together again. I said some horrible things to him, but it wasn’t long before we were collaborating again, this time on the opening titles to the new Late Night with Conan O’Brien. 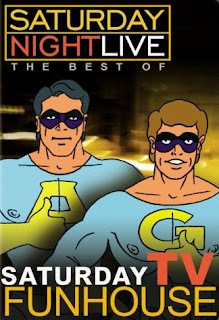 The Saturday TV Funhouse series grew out of the first Ambiguously Gay Duo cartoon we did with Robert for the short-lived Dana Carvey Show in 1996. 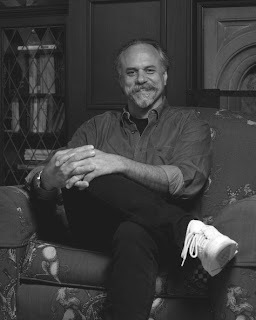 He later took the AGD cartoon to Lorne Michaels and proposed the Saturday TV Funhouse series. Before we knew it, we were in production on these groundbreaking shorts, about twelve a season. I consider these films a big deal. They really helped people see animation as an adult vehicle instead of just “Ducks & Bunnies”. The Simpsons was there, Beavis had hit, but this was on a different level of visibility. Plus, we were all getting credit on these self-contained little films. The other aspect that was a dream was the fact that NBC and SNL had a lovely umbrella of indemnification that allowed us to parody and satirize on a level that had incredible bite! Finally, we were able to create a new style of animation that also helped push the edge of Robert’s writing where it needed to go. Our problem as a studio was we were gradually becoming type-cast by the work. I’d worked very hard to not have a style, but because of the visibility of the work and our name right up there, people became conditioned to think that’s all we did, or worse, were capable of. By 2000 it was time to move on. 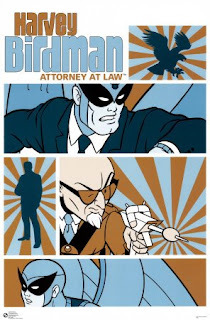 JA: Tell me about your work on the pilot of Harvey Birdman, Attorney at Law, and also how it was received by the network when it first aired. J.J.: Cartoon Network’s Michael Ouweleen and Eric Richter rang us up and wanted to know if we’d be interested to work with them on the pilot. Patrice and I thought it was a terrific idea and dove in. It was fun to help sculpt the concept of the show and character, plus the mix of styles was an interesting twist to cartoon animation. The show was a shoe-in for success. The network had approved the production of the pilot solely on Eric’s singing of the show’s opening song! It also helped inaugurate the Adult Swim block. 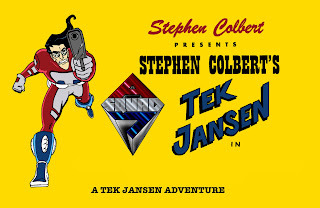 JA: You have also worked with Stephen Colbert more than once, providing animation for both Strangers with Candy and The Colbert Report; do you have a piece of animation you have been involved in that stands out as your favorite? J.J.: We also animated his voice as Ace from the Ambiguously Gay Duo (Steve Carell does Gary), created his "Spartina" title card used at the end of The Colbert Report, worked with him on a Daily Show with Jon Stewart in a Schoolhouse Rock parody, and suggested Michael and Eric cast him in Harvey Birdman. The Tek Jansen cartoons are right up there with Ace & Gary as favorites of mine. JA: Tell me about your work with the USA/NBC live action series Psych; what was it like working with creator Steve Franks? J.J.: The Big Adventures Of Little Shawn & Gus interstitial series grew out of my friendship with Jason Holzman who was the person I worked with at the EURO/RSCG ad agency on some "Give Blood” commercials. We created a superhero together called “Red Defender”. He moved to NBC/USA Networks and they had the idea to do some webisodes that could help support their very successful Psych series. We (Dan Madia here in the studio was the designer) first worked with the network to prepare a presentation to the creators of the series (Steve Franks front and center) and then collaborated intimately with the network and creators. Steve and his crew couldn’t have been more enthusiastically supportive! Really great! JA: What are your thoughts on current animation being produced in the industry, what stands out as being your favorite, and what would you say is the worst? J.J.: I don’t watch a lot of TV animation. I do enjoy South Park, Family Guy, and I think Flapjack has some neat stuff going on. Brad Bird’s work in general wows me as well. I love going to festivals like Ottawa and I’m looking forward to Platform #2 – this is where you see some really great stuff. Bill Plympton, Michael Sporn, Aaron Augenblick, and John Kricfalusi deserve credit for keeping the energy level high with independent work. As a matter of fact, it’s in the independent world that the important stuff’s being done and it’s finally getting mainstream attention. The worst? I’ll keep it general by saying stuff that doesn’t seem to be exploring anything new and just looking, and sounding, formulaic. JA: What working artists would you reccomend we keep our eyes on that everyone might not yet be aware of? J.J.: What I love about the availability of mainstream animation software is the experimentation we are seeing by print artists delving into animation. Jonathon Rosen and Nathan Fox come to mind. Their work is raw and they approach animation from a different foundation because of their design and drawing background. JA: Do you have a favorite cartoon of all time? J.J.: Yellow Submarine, Ryan, Disney’s Pinocchio, Magical Maestro, Syssaphus. . . I guess that would be a “no”.